This engaging set from Breyer Model Horses comes with everything needed to give the pony a bath and some pampering! 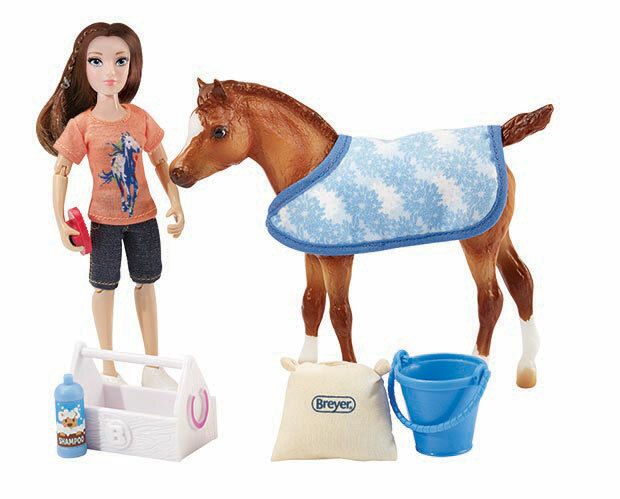 Includes: 6" articulated doll, pony, pony blanket, bucket, tack box, feed bag, curry comb, and shampoo bottle. This Fleabitten Grey Morgan mare has a very special friend - a lovely sable Shetland Sheepdog! Introducing the New Classics Spring Creek Stable. The roof swings open on either side for additonal access to 2 roomy stalls and loft, which has a moveable ladder. Use the 4 fencing sections to create an attached paddock behind the barn.